Hardly a month goes by that I don’t hear about someone I know directly or indirectly who is moving from the U.S. to an international destination for a job. This trend was in place before the severe, late 2000s recession hit. Prompted by President Obama’s Town Hall meeting on CNBC, I found a graph (below) depicting how the U.S. is increasingly at a disadvantage as the countries we compete with continue ratcheting down their corporate income tax rate while the U.S. corporate income tax rate remains elevated at the second highest level in the world among the 33 member countries in the Organisation for Economic Co-operation and Development (OECD). Japan, a country whose economy has been in a long-term funk, has the highest corporate rate but they have recently pledged to reduce their corporate income tax rate so the U.S. is soon to have the highest corporate tax rate. Much has been written about stagnant U.S. stock prices during the decade just past and the fact that total employment ended the decade about where it began. Little, however, has been written about the contributing role that increasingly high U.S. corporate income tax rates have had on slowing U.S. economic growth and employment. In the 1980s and 1990s, by contrast, the U.S. was not at a competitive disadvantage in terms of U.S. corporate income tax rates. Check out the longer-term graph below which compares the U.S. corporate income tax rate to the average of OECD countries. The U.S. rate was about in line with the OECD average during the 1980s. During the U.S. economic boom of the 1990s, the U.S. rate was consistently lower. During the 2000s, the OECD average has been consistently lower and the gap widening so that now, the OECD is about 10 full percentage points lower than the U.S. rate. It’s not easy or politically popular for politicians to argue for lower corporate tax rates. 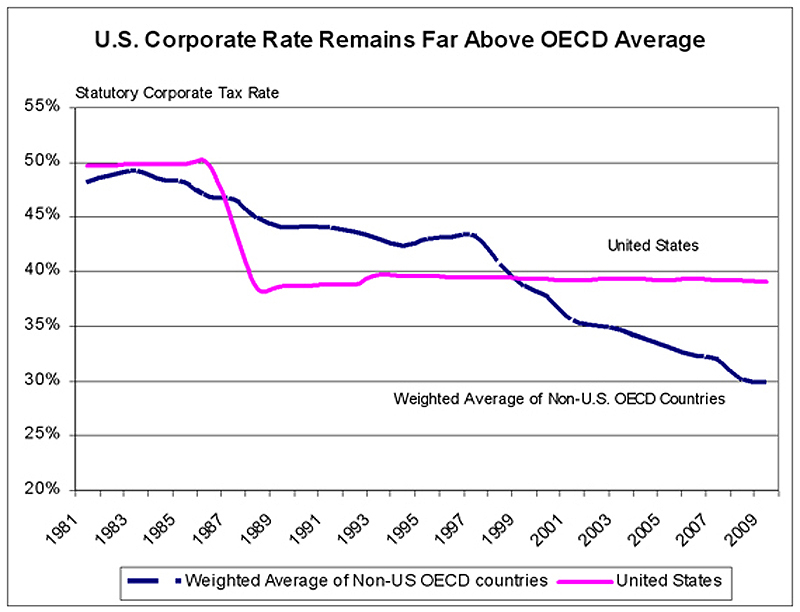 The U.S. is the only OECD member country to increase its corporate income tax rate over the past 20 years. Two senators – Ron Wyden (D-OR) and Judd Greg (R-NH) – recently proposed reducing the U.S. corporate income tax rate from 35% to 24% in their “Bipartisan Tax Reform and Simplification Act.” Their bill will also eliminate a number of special interest tax breaks. The U.S. is the only country that taxes domestically headquartered companies on income they earn overseas. As I have long stressed, when investing in stocks, it is essential to have a globally diversified portfolio. Besides wanting investments in foreign companies and economies which have higher growth rates and offer better investment values, some overseas companies and economies enjoy faster growth thanks to lower corporate tax rates. Unfortunately, in all the partisan, political debates, there’s little discussion about what is an “optimal” tax rate on corporations and individuals. Arbitrarily arguing for higher or lower tax rates without context and knowledge about its economic impact is foolish. As my regular readers know, many countries are growing faster than the U.S., are enjoying far lower rates of unemployment and experiencing robust stock markets. Political ideologues like Paul Krugman who argue that the world is in a depression fail to examine these facts and instead dwell on the shortcomings of the U.S. economy without correctly identifying their real cause (he thinks the path to U.S. economic success will come from more government stimulus spending). We do know that all other things being equal, if you tax something at a higher rate, you’re generally going to get less of that taxed activity. Relatively high U.S. corporate tax rates leads to lower U.S. economic growth and domestic hiring. That’s Econ 101 and the 2000s are proof positive of that. Corporations - just like people - can vote with their feet.